You may have read our two recent articles. We received so much positive feedback that Aaron Biros (editor-in-chief of Cannabis Industry Journal) has invited us to continue with our own column at CannabisIndustryJournal.com. We are very happy to launch this column, and we thought we would take this opportunity to introduce our project, our vision and ourselves so you can understand where we are coming from when you read this series of articles. Brett and I both have a background in business sustainability and corporate responsibility. We both have backgrounds in management consulting, with a specific expertise in sustainability issues along the supply chain. We have been working together for almost nine months now on sustainability issues in the Bay Area. In May, we started to get interested in sustainability in the cannabis industry and before we knew it we were diving deep into research relating to the environmental, social and ethical impacts of the legal cannabis industry. It was actually difficult to find a lot of information, as the reign of prohibition still very much influences what is available. In June, we attended the National Cannabis Industry Association’s conference in Oakland to open up the conversation with cannabis industry players and to find out about people’s attitudes and approach to sustainability. The results were overwhelmingly positive. Not only were we encouraged to launch a project, but also excited to discover that many of the speakers presenting at the conference referenced sustainability in one way or another when they talked about environmental impact awareness, social justice, ethics or about staying competitive when “big business” enters the market. What started out as a side project quickly became the center of focus this summer when we decided to incorporate Project Polaris, a California non-profit, to deliver sustainability knowledge and expertise to the cannabis industry. Thinking about sustainability, means thinking strategically about business. As we forge a new and upcoming industry, let’s seize the opportunity to make it a sustainability-focused one! Let’s create generally accepted industry principles that fosters a positive image of the industry and teaches newcomers about best environmental and social practices. Let’s create a voluntary and industry-led socially responsible code of conduct for cannabis business owners and suppliers, helping the regulators, as they will be drafting all of the future regulations of the legalized cannabis market. Let’s do more research on the market and the consumer. Let’s develop clean and green alternatives to dirty processes or practices. Let’s elevate the discussion and create a model industry, one where short-term, large-scale, quality-lowering corporate interests are kept at bay. With this vision in mind, we created Project Polaris because we believe that this is a real opportunity for the industry to be a role model for other industries (and educate legislators as well as drive public opinion in those states that are still under prohibition laws). We believe there is a real economic opportunity for those businesses that understand how to embed sustainability properly within their business model. Because we know that sustainability influences legislators in a positive way because it sheds a positive light on businesses. 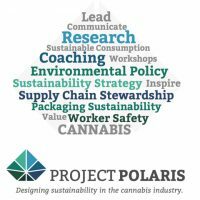 In the upcoming months, we will continue to research and report on sustainability-related issues facing the cannabis industry, such as packaging, edibles, “organic” in cannabis, butane extraction versus CO2 extraction and so on. We also welcome questions from our readers. If you have a question, please post it in the comments section below. We will also take this opportunity to call out to cannabis industry organizations, cannabis businesses, or cannabis related services and product suppliers to get in touch with us if they wish to find out how to integrate sustainability more concretely into their action plan. We are not planning on doing this alone, we are seeking partners to join us on this journey, and we want to partner with you on your journey to Cannabusiness Sustainability. PS: We still have one seat open for the board of directors and would love to hear from you if you are interested!